Microsoft hid one really handy and essential feature - the possibility to view message headers. The truth is that it contains a lot of information for you to retrieve. The real address of the sender (not the one you see in the From field since it can be easily falsified). For example, you received an unexpected email from yourbank.com. It looks exactly like all emails you usually get from your bank, still you have doubts… You open the message headers just to see very.suspiciouswebsite.com instead of the sender's server mail.yourbank.com :). The sender's local time zone. It will help you avoid entering Good morning when it is late night on the recipient's side. Email client from which the message was sent. The servers that the email passed. With emails it is just like with letters sent by post. 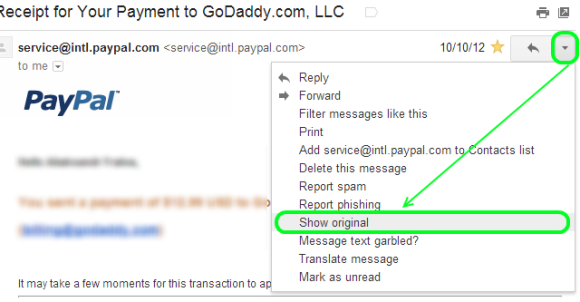 If your and recipient's inboxes are not on the same website, the letter will need to pass some break points. On the Internet their role is played by special email servers that resend the message via third party websites until it finds the recipient. Each server marks the message with its time stamp. It can be really entertaining to see that an email from somebody who is in the same room crossed half of the world to get into your inbox. It can happen that an email gets stuck within one of the servers. It can be broken or it can fail to find the next third party server. If you don't know about this you can blame the sender who did reply an hour ago. However that happens really seldom. Open the email with the headers you need to see. Select the Files tab in the email's window. You'll get the "Properties" dialog box. In the "Internet Headers" field you'll see all information about the message. It is 2013 already, but Microsoft haven't made the Properties dialog stretchable and the details are shown in a tiny field. So I suggest clicking within the Internet headers field and then pressing the Ctrl + A keyboard shortcut to copy the information to clipboard. Now you can paste the details to a new Word document or Notepad to have them at a glance. The Properties box is a really handy option and it would be nice to be able to get it at your earliest convenience. 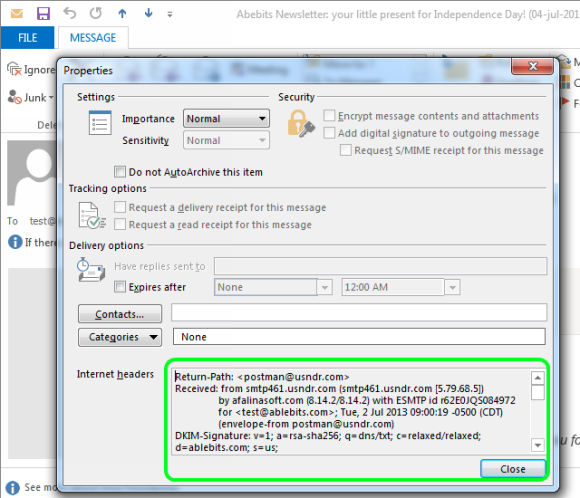 You can use it to add a digital signature to an email, or turn on the option "Do not auto archive this item". With the help of this feature you can also enable such tracking flags as "Request a delivery receipt for this message" and "Request read receipt for this message" to be sure that the email was received. Go to the File tab and select Options from the left menu list. 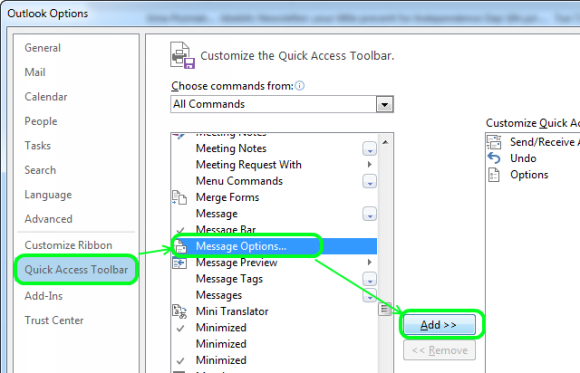 In the Outlook Options dialog, pick Quick Access Toolbar. Select All commands from the Choose commands list. In the below list find and select "Message options" (you can press M to be able to scroll faster). Please don't make the mistake I made, it is "Message options" you need, not "Options". Press the "Add >>" button and click OK.
That's it! Now you can see the message headers without opening the email itself and enable the necessary options for the outgoing emails in a few clicks. In the list of emails, right-click on the one with the headers you need to view. Select the "Message Options…" from the menu list. In the message menu pick View -> Message headers. You'll see the Options dialog that hasn't really changed much over the years. So please find the details above. Or you can run the menu for the email in the main Outlook window and select "Options…" that will be the last in the list. Click on the email with the headers to view. Click on the down arrow next to the Reply button on top of the email pane. Select the Show original option from the list. The entire headers will appear in a new window. Log into your inbox via Outlook Web Access. Double-click on the email to open it in a new window. Click on the "Letter" icon. In the new window you'll see the message headers under "Internet Mail Headers". 11 Responses to "How to view Outlook Email Headers (internet headers)"
Excellent thanks - was really hacking me off that MS had hidden such a necessary function. Their lookups were no help on the issue so thanks a mill. Thanks, this is really useful. 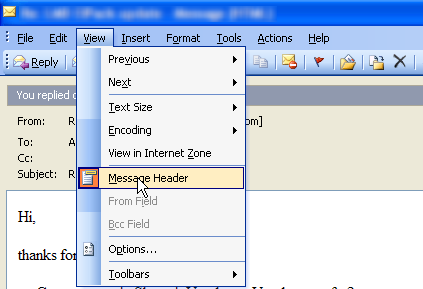 Do you know if, when replying to or forwarding a message, it is possible to include the time zone (and not just time) in the header part of the forwarded/original message (I'm using Outlook 2010)? We have Win 7 Prof 64-bit. Several places I have seen the Open email / File/ Properties sequence to obtain the Properties pop-up with the 'Internet headers' box half-way way down. DOESN'T WORK!!! No 'Return-Path', 'Received from' etc info shown - the box is empty. is there some setting I need to change? The Properties window is opened differently in different Outlook versions. If you let me know what Outlook version you have installed, I'll point out the proper way. If you can open the window but don’t see some of the properties, then most likely your organization uses an Exchange server that cuts off some headers. If you are viewing a sent message, you won’t see the return-path there. When I try this for a Sent email the Internet Header field is blank, how can I get that info? OR when sending an email to someone in 'contacts' with multiple email adresses how can I see which email address the email was sent to? 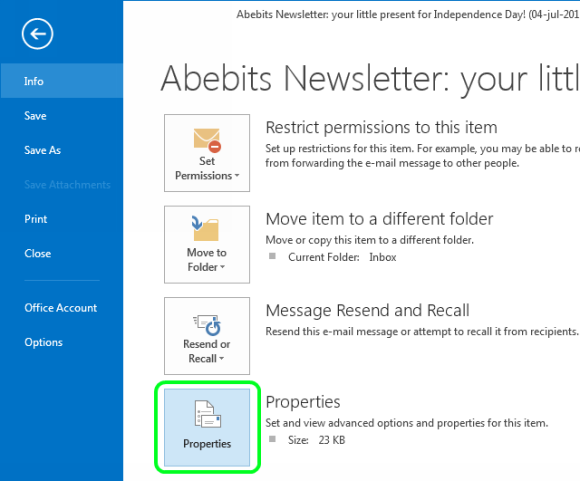 I have outlook 2010, I do not see the file tab or the message tab at the top right of any of my emails when I open them, in order to get to the properties, do ad a header. I looked at all your instructions above and I don't have the file and message tab at all, can I change my view? This is a nifty way to make that info easier to find. What would be super is a way to be able to click and option that would either copy the header int to the body of a new email or add it to clipboard making it easy to do that same. Thanks for posting this. Used to be easy to see but not any longer. Every site I've googled for an answer has proffered the same info. In my Outlook 2016, the Properties box has been empty in 6 random email I selected from my sent folder. Your solution is not an end-all, be-all! If it is in your sent items it wouldn't have any metadata yet because it is saved there before it goes anywhere. Hey, buddy, I haven't Outlook environment but need to view My PST file emails headers. Can you suggest me any free solution for that like Free Viewer PST Viewer to open PST email headers without having Outlook environ?